A scone recipe is like story structure, the scaffolding upon which most tales are built. A good story needs a beginning or exposition, a conflict that grows to a climax, followed by falling action that leads to resolution or denouement. A good scone begins with the introduction of flour, sugar and butter to milk and baking powder. It grows into a dough, sticky with possibilities the baker must resolve: Will you combine dried fruits with chocolate? Or will you strive for a balance between sharp cheddar and pungent herb? Once the question is resolved, the dough is baked and ready to eat. Overcoming the Monster A hero must confront a monster in a fight to the death. Jack and the Beanstalk, Dracula. Rags to Riches Someone who, to the world seems quite common, is hiding a second, more exceptional self within. Jane Eyre, Cinderella, The Hummingbird’s Daughter. The Quest The hero sets out on a hazardous journey to find something valuable and usually succeeds. The Wizard of Oz, Raiders of the Lost Ark. Voyage and Return The hero travels to an unfamiliar world, which at first is marvelous, but grows increasingly dangerous. After a dramatic escape, he returns to his familiar world, often wiser for the experience. Alice in Wonderland, Gone with the Wind, The Commoner. Comedy A misunderstanding causes the characters to tie themselves and each other into a knot that seems almost unbearable. But in the end, everyone and everything gets sorted out, happily. Shakespeare’s comedies, Pride and Prejudice, The Best Christmas Pageant Ever. Tragedy A character through some flaw or lack of self-understanding is drawn into a fatal course of action which leads to disaster. Madame Bovary. Rebirth The hero is held in evil’s deadly grip. When it seems that evil has triumphed, the hero is saved, sometimes through the power of love. Snow White, Shadow of the Wind. Last week, I did a rags-to-riches riff on my basic scone recipe. 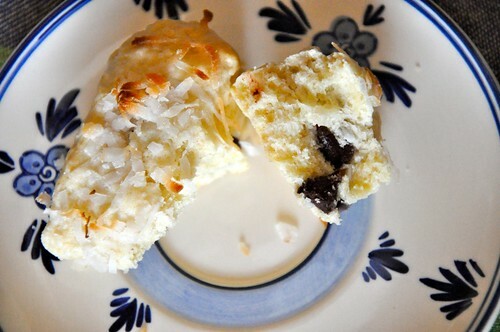 I took the shaggy coconut, married it to chocolate and created a scone fit for kings. Well, maybe I exaggerate, but that’s a storyteller’s license, right? 1 cup of dried fruit, cheese, nuts, oats, chocolate or a combination to suit your taste buds. 1/4 cup cream, half and half or Tuscan Whole Milk, the Amazon essay. Place flour, cream of tartar, baking soda, salt, sugar and butter in a food processor and pulse until mixture resembles coarse cornmeal. Pour flour mixture into a bowl and add milk. Add your embellishments. Working quickly, blend ingredients together with a rubber spatula into a soft, slightly wet dough. Turn onto floured counter. Form dough into a disk about 8 to 10 inches in diameter. Cut into eight wedges. Place wedges 1 1/2 inches apart on greased baking sheet. Brush tops with cream and sprinkle with cinnamon sugar. Bake 10 to 15 minutes or until scones are light brown. Coconut-Chocolate Substitute milk with coconut milk, add 1/2 cup shredded, sweetened coconut, 1/2 cup chocolate chips. 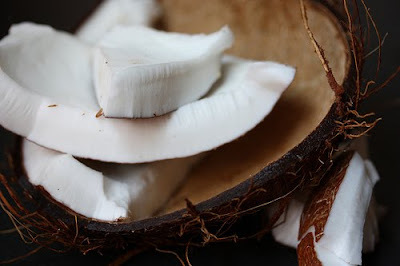 Optional: 1 teaspoon of coconut extract. Brush tops with leftover coconut milk from the can, sprinkle with shredded coconut and press lightly so the shavings stick in the dough. Cherry-Chocolate 1/2 cup semi-sweet or bittersweet chocolate, 1/2 cup chopped pecans, 1/2 cup dried cherries. Cheddar-Herbs 1 cup shredded sharp cheddar cheese, 3 tablespoons fresh chopped parsley, 2 to 3 tablespoons chopped scallions, 1 tablespoon chopped fresh dill (2 teaspoons dried).